A charcoal suit is a good bet for a first suit. It’s one of my personal favorites! I rank it with navy blue and regular gray as a nice conservative, safe colors. 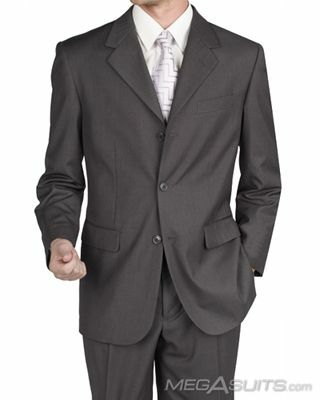 Get 2 suits for the price of 1 on men's suits and men's wear starting from $169 on Megasuits.com - Shop Now! It’s a dark color that in my opinion, site in between black and gray. It’s dark enough to fit in at the office without looking too out of place. You’ll want to avoid a shade that has too much of a sheen or gloss to it. They are versatile enough for the office but also for a night out. They’ll also work for an interview or wedding if you need it. I’m a fan! Most major makers from Calvin Klein to Hickey Freeman carry some shade of charcoal suit in their lineup. I think the two-button pattern works best with these but you’ll also find nice three button looks too. I’ve seen some versions with pinstripes but I’m not a big fan, I think charcoal is best as a solid. Go for a medium-wool blend and it should hold up well in the winter and cold climates. As far as shirt and tie combinations, a basic white shirt with a nice patterned tie is probably your safest bet. I have a nice burgundy tie with big patterns that looks nice. I also wear a light blue tight patterned shirt with a light yellow solid tie that looks nice. A light blue solid shirt can work with patterned light colored ties. For shoes, the main consensus is a basic black lace-up. Just be sure to make sure it’s nice and shined. Another popular choice is a dark brown or burgundy, which I am not as much of a fan of. It’s easy to get too light of a brown and tan and charcoal doesn’t look too great in my opinion.